Czech Republic snatched a point from the grasp of Croatia on Sunday afternoon at the Stade Geoffroy Guichard. Croatia looked well on their way to the knockout stages, holding a 2-0 lead in the second half thanks to the "Ivans" - Rakitic and Perisic. However, a late surge from Czech Republic, resulting in goals from Skoda and Necid - both substitutes - was able to see them to a shock draw in a game marred by crowd disorder in the stands. There were emotional scenes pre-game when the Croatian captain Darijo Srna - who's Father sadly passed away on Sunday - was moved to tears during the national anthem. The left-back had only returned to France a few days ago, having attended the funeral back in his hometown. Croatia started the game the much brighter of the two sides, carrying the same tempo they did in their blinding performance in the opener against Turkey. Star-man Luka Modric, as expected, was running the show in midfield and barely putting a foot wrong or misplacing a pass. The Croats had a great chance to go in front early when Mario Mandzukic set up Ivan Perisic. The Inter midfielder was unable to connect with his Serie A compatriots cross, gifting Czech Republic an almighty let off. Croatian manager Ante Čačić looked on in frustration as his team continued to not make good of the chances they were creating. In the 37th minute Ivan Perisic broke the deadlock. The talented midfielder charged at the Czech defence and despite being surrounded by white shirts he found just enough space to dispatch the ball low and hard beyond the Petr Cech from inside the area. A lovely finish and another brilliant goal at these European Championships. With an just under an hour gone on the clock Croatia doubled their lead. This time the other Ivan - Ivan Rakitic. The Barcelona man sprang the offside trap and conjured up a delightful chip over an on-rushing Petr Cech. In the 65th minute, there was a scare for the Croatian fans. Luka Modric limped off the pitch, however it was just a precaution. But that was the least of their worries. With Czech Republic beginning to lose hope in there chances in the game and the tournament, they were given a lifeline. Substitute Milan Skoda rose high above the defence to meet Arsenal man Thomas Rosicky's cross to loop the ball between the posts. Was the comeback on? We'd have to wait for the thrilling conclusion, however. With just about 5 minutes to go, referee Mark Clattenburg was forced to stop the game. 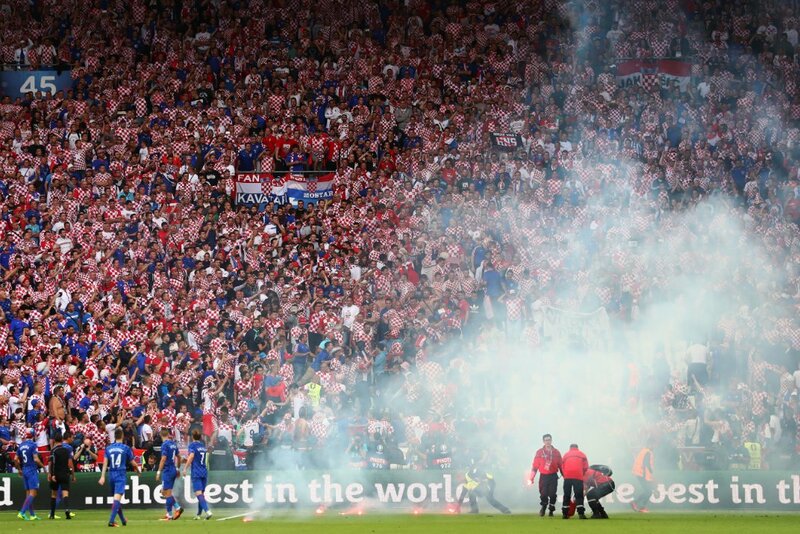 Major commotion was emanating out of the Croatian stands, flares were thrown onto the pitch and there were fights breaking out among supporters. The Croatian players pleaded with their fans to stop and after a few minutes the game was resumed. Appalling behaviour indeed. It was about to get a lot worse for Croatian fans and the players, however. Croatiancentre-back Domagoj Vida committed the worst possible sin, handling the ball in the area during the Czech attack and a penalty was the punishment. Up stepped another substitute, Thomas Necid, who made no mistake and blasted the penalty home, and somehow, someway, Czech Republic, despite being dominated and completely outclassed by their Group D rivals were level. The match ran into the 100th minute and when the final whistle was blown, many, especially the Croatian could not believe what had transpired. They had literally thrown the game away. Credit must be given to Czech Republic for their persistence, but Croatia knew they had the game in the bag. That's football - always drama.